The leader; the Camfil “Farr 30/30” is an industrial-strength, MERV 8, high capacity, pleated filter built for the toughest of applications such as healthcare, pharmaceutical and industrial facilities. It was awarded an Energy Cost Index (ECI) of five stars, the highest performance rating available. Constructed of Camfil’s exclusive cotton/polyester media bonded to a welded-wire support grid, formed into a radial pleat and enclosed in a water-resistant beverage board framing. Guaranteed to outperform and outlast all competitors by at least 2 to 1. 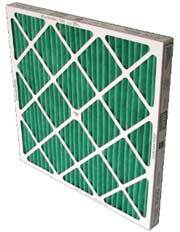 The Camfil Aeropleat III is a standard capacity, MERV 8, pleated filter designed for the contractor and commercial markets where quarterly filter changes are required under preventative maintenance contracts. Constructed of a cotton/polyester media, bonded to a welded-wire support grid, formed into a radial pleat and enclosed in a beverage board framing. 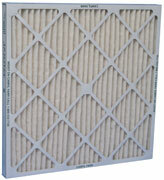 The Camfil Aeropleat IV is a high capacity, MERV 8, pleated filter designed for the commercial marketplace. The Camfil AP-Eleven is a high capacity, MERV 11*, pleated filter. The MERV 11 rating is achieved using a charged synthetic media. This filter, like all other charged media filters, loses some of its efficiency within a short time of installation due to dirt load and/or humidity. Constructed of a charged synthetic media, bonded to a welded-wire support grid, formed into a radial pleat and enclosed in a beverage board framing. 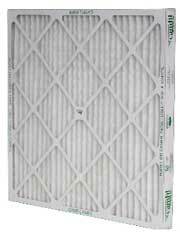 The Camfil AP-Thirteen is a high capacity, MERV 13*, pleated filter. The MERV 13 rating is achieved using a charged synthetic media. 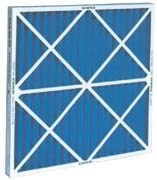 This filter, like all other charged media filters, loses some of its efficiency within a short time of installation due to dirt load and/or humidity.